I've been collecting images of newspaper and broadside headlines from the 1860s to be used as graphic elements for an exhibit on the American Civil War the Museum is planning. The Historic American Newspaper database has been invaluable in this endevour. However, in the midst of my browsing, I decided a search for "Albany Ale" might yield some results—and it did, with a surprising result. As I expected 19th century newspapers were rife with small adverts and listing for a cast of the usual Albany Ale suspects—Taylor, Dunlop and Boyd—the list goes on into the late 1800s. 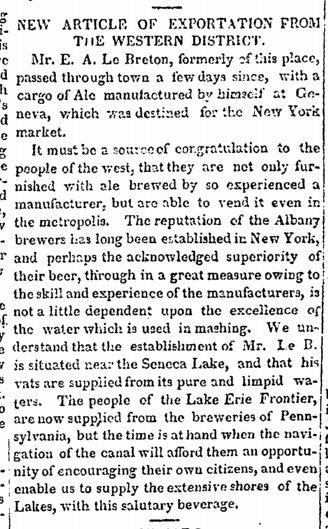 Amongst all these known-to-me brewers was a humble little ad for bottled beer, placed in the Albany Register on May, 5, 1803. That little ad was bought by the then 27 year-old, Edward A. Le Breton—gentleman, businessman and brewer. In the two years that we've been researching Albany Ale, this past week is the first time I've come across Edward Le Breton—and I'm glad I did, because he has an interesting story. Le Breton was born in England in 1775, and while I don't have any information about him between that time and 1803, I do know, at some point he partnered with Thomas Morgan to open Le Breton & Co., a brewery, on Pearl Street in Albany. Two years after the small ad in the Register appeared, another ad exalts Le Breton & Co.'s Fine Albany Ale, in the March 22, 1805 edition of the New York Morning Chronicle—a Manhattan based newspaper. This little ad, as far as I can tell, is the oldest record of Albany Ale made by a specific brewer. Pretty cool, huh? "...mixing and finning of their ale, use unwholesome and even poisonous materials, which report he, this deponent saith, is absolutely false, and without foundation..."
Le Breton also offers a $200 reward for information leading to the libelist—that's big bucks back in 1807. Adding insult to injury, for Mr. Le Breton, a New York brewer—Robert Barnes—ran his own ad the following month, in the same paper, capitalizing on the sullied good name of Le Breton & Co. Mr. Barnes assured the public of his Amber ale's purity—In fact he goes as far as to offer his product up for chemical analysis! How could you not trust him? All of this seems to have had an affect on the brewery, and it appears that, the now 32 year-old Le Breton, begins to have some debt collection and solvency issues. 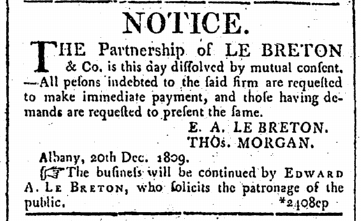 By 1808 what appear to be insolvency ads, stating the need for "All persons indebted to Le Breton & Co." to make "immediate payment" begin running in both Albany and New York papers. These ads are followed by a plethora of ads stating the consensual divorce of Le Breton from & Co.— Le Breton dissolves his partnership with Thomas Morgan, but retains some ownership of the brewery. These ads run from 1809 through 1812. It is also during this period that Le Breton's wife dies and he leaves Albany for Manhattan. "Le Breton's Ale and Porter merit this encomium; and justice requires us to say, that their superiority and excellence have been admired and extolled by gentleman of the first taste and respectability/"
"He has followed the business for a number of years in Albany; and his intelligence, experience and judgement, cannot be disputed." "Mr. 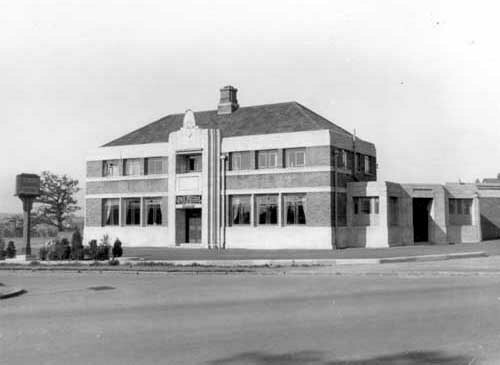 Le Breton has lately moved into this city for the purpose of establishing a brewery..."
"There has been, for some years past, a meritorious competition existing among brewers, particularly of this city, in attempting to produce an article that would take best with the public, and be equal, if not superior (if possible) to the malt liquor produced in England. This laudable, (and advantageous competition to the public) commenced with the celebrated "Albany ale" brewed by a Mr. Le Breton, some years ago..."
Strangely enough, it appears that Mr. Le Breton left New York City between the time that article was written and 1822. A short article from the Albany Argus on May 17, 1822 mentions a stop made by the 47-year old Le Breton, in Albany, en route to New York City with a cargo of ale. The article explains that many Central New York towns are being supplied with Pennsylvanian beer, but the imminent opening of the Erie Canal might change that. 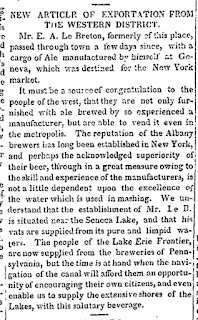 It appears that Mr Le Breton saw an opening in the market, and has opened a brewery in the Finger Lakes Region, on Seneca Lake, near Geneva New York, to exploit that market. Le Breton's time in Geneva was also short lived. Seven years after establishing himself in Central New York, he leaves for Michigan. In 1829 Le Breton establishes himself with the Detroit Brewery and begins to make improvements to that facility, but shortly thereafter, in October of 1830, the Albany Argus prints his obituary taken from The North Western Journal. Edward A. Le Breton was dead at the age of 55. I'm drawn to Le Breton's story because it humanizes Albany Ale. The history of men and brewers, like Ganesvoort, Taylor and Boyd has been shadowed over time, but there's still a record—beery dinosaur footprints, if you will. How many smaller brewers, like Le Breton, on the other hand have all but been erased from the collective conscience? Le Breton's story show the tumultuous nature of brewing in the 19th century—the fickle nature of the beer consumer, the backstabbery of the industry, and how quickly the facts are forgotten. But, perhaps, there's an aspect of Le Breton's involvement with Albany Ale that is even more important. The little ad featuring "Fine Albany Ale," from back in 1805, may have been the first to advertise Albany Ale as Albany Ale and associate that product with a known brewer. Le Breton may not have been the first brewer to make Albany Ale, but he does—at this point—seem to be the first one who's beer is referred to as such. 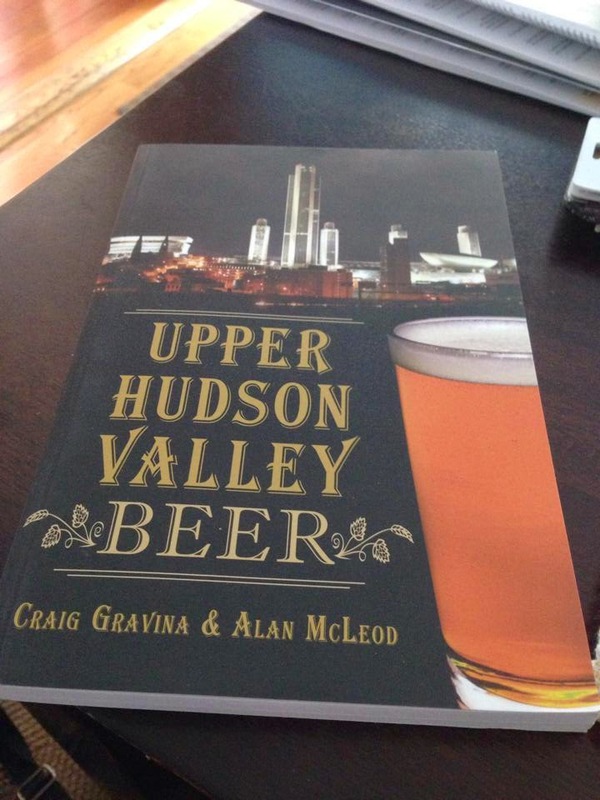 Perhaps since the product was being brought into Manhattan it was simply a way to differentiate it from beer being made in New York? Or could it be that the name "Albany Ale" begot the style? As usual, for as many answers I've found, we have twice as many new questions—but that's what this project is all about. Thanks, arn, this one truly came out of the blue! From William Dalton, Travels in the United State of America (1821): "Albany ale is almost as much famed in this country as London Porter is throughout England. It is sold by the brewers for eight dollars, or thirty-six shillings per barrel; and retailed by the tavern and hotel keepers at the rate of sixteen dollars, or twice the cost price. I was sorry to learn. that, although from the low price of the malt and other ingredients of brewing, the brewers must receive a considerable profit, yet, some of them have been in the habit of infusing noxious drugs into the liquor." Excellent! And from 1821 to boot!  That's fairly early in the Albany Ale arc. Did I Just Hear a Collective Sigh of Relief?